Digital Signage Displays - Best solution to programe your own presentation. All digital signage displays (which also called advertising digital photo frame or programmable led sign) here are made by EOOKE company, they all comes with business LED&LCD digital signage monitors and special digital signage systems inside to allow biz owner or retailers like you to program your own presentation, manage effectively in engaging target customers via your FHD video and photos for a maximum result. EOOKE's indoor digital signs displays are made to run for long periods of time at higher brightness with lower power consumption and it has been especially tested for reliability in portrait and landscape orientation. The screen come with brushed aluminum housing,security locker and professional signgage hardware, which allows for better heat dissipation and provide comprehensive protection and prevent from a unauthorized access for unattended operation. 1. FHD Digital Signage Media Player. This special media player supports various video/photo formats up to 1080p video playback. Automatic update & playback of all media contents stored on a SD card and/or USB drive in infinite loop or custom order created by Playlist. 2. Power Timer. 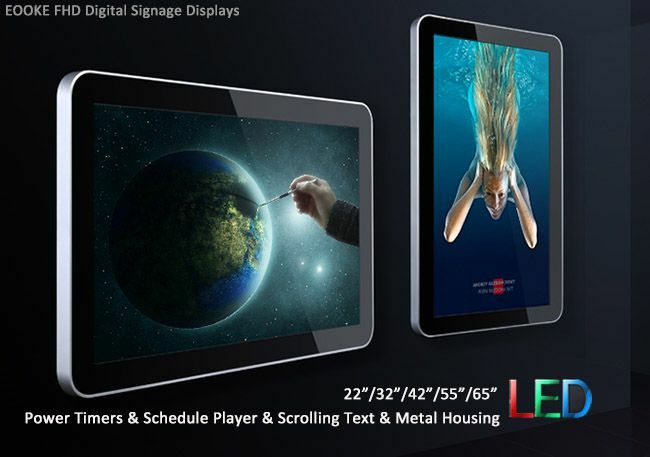 Turn on/off the digital signage displays at any time you want. 3. Programmable Playlist. All Media contents and Playback order and display times can be programmed in the Playlist. You can schedule when and how long is the media contents displayed by using the free software we provide. What industry is the big benefactor of such kind of digital signage solutions? Any industry that want to attract attention of visitors, build brand and increase sales. Cinemas use the AD displays to show times, movie trailers, tickets. Hotels and restaurants display menus, foods, and room’s info where people get to see exactly what it looks like before placing an order. Museums/Hospital/School can use it to provide information on exhibits/doctors/teachers and other attractions, people are kept well-informed whether they are on a deck. The application of digital signage displays and digital signage players extend well beyond to Bank, Retail Park, Transport Hubs, Concourses, Super market, Casinos, Gov dept, Nightclubs and much more around the globe. Need specail digital signage solution for your corporation? Please feel free to contact our support. Need just FHD digital picture frames for home? Check here! HD 65" large digital photo frame which design for biz advertising purpose.